I am so thrilled to be a part of Kim's favorite room series. I have loved seeing all the beautiful and inspirational spaces that others have shared, and I'm happy to welcome you into my favorite room. 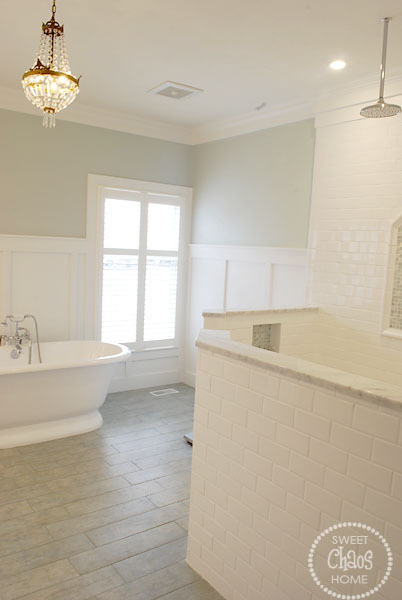 Our master bathroom was completely overhauled in 2011. It was my first attempt at designing a total room remodel, and I loved the process of planning the layout and choosing all the materials. Documenting our experience is what propelled me into the world of blogging. The combination of wallpaper, carpeting, a ginormous swimming pool bathtub, and a shower and toilet crammed into a small water closet made this my least favorite room in the house. After a complete gut job, removing walls and moving plumbing, the toilet is now in a separate water closet, and we have a large open shower. I love the spacious shower, and I don't miss cleaning glass one tiny bit! 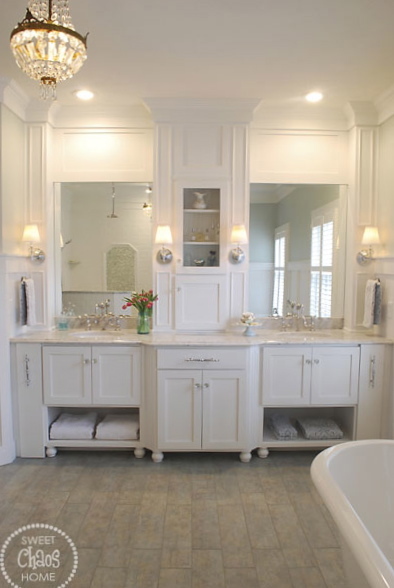 The vanity area is light and bright, and the cabinetry provides ample storage. 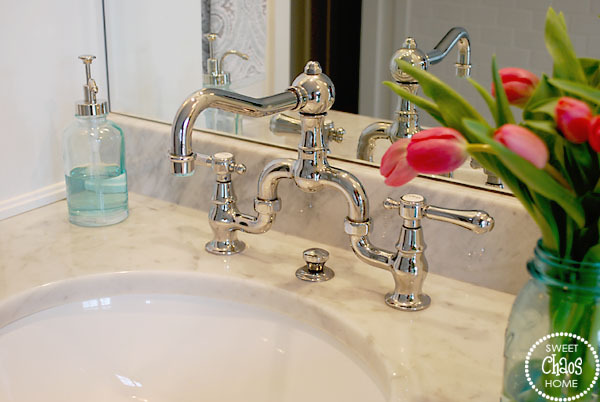 I selected finishes that would appear timeless, such as carrara marble countertops and chrome bridge faucets. One of my favorite things in my favorite room is my antique chandelier. At the end of an exhausting day keeping up with a traveling husband, four young sons and a big ole dog, there is no place I'd rather be than in a hot bubble bath in my favorite room. I'd love for you to come visit me at Sweet Chaos and check out the other rooms I'm working on! Our house might be chaotic, but we have a lot of fun. Kim, thank you so very much for allowing me to share my favorite room with your readers. You have been such a wonderful blogging friend to me, and I'm so grateful to you for all your support and encouragement. 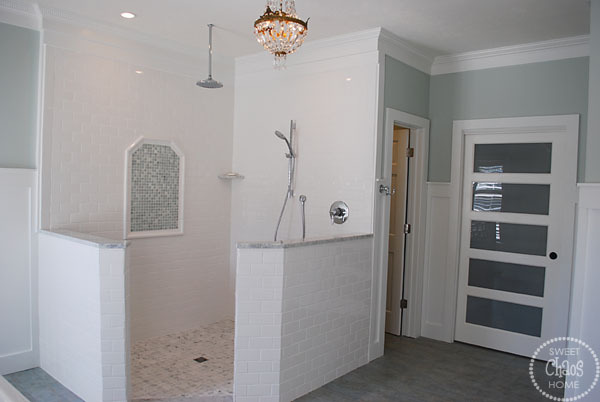 Thanks, Carolyn, for sharing your stunning master bathroom. I remember gasping the first time I saw it. 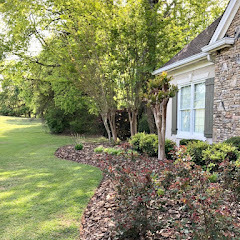 Alright everyone, you will want to see more of Carolyn's beautiful home so please hop over to Sweet Chaos Home to see much more. 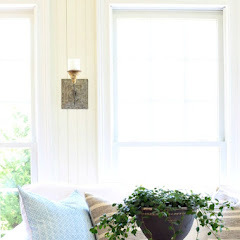 If you have missed some previous guest bloggers' favorite rooms just check them out here. Hi Kim and Carolyn! Wow nothing can be said about this bathroom except absolutely gorgeous - the most beautiful bathroom I have ever seen and I've looked at thousands over the last 32 years!!! Excellent job Carolyn! What a gorgeous bathroom. I remember this bathroom when it was revealed a while back. Stunning! I wonder if she would let me stop bye for a quick bath!! :) Gorgeous! Oh I remember pinning that bathroom a little while back. It's just beautiful. Can't wait to check out her blog. Have a great day! Wow. That is my idea of the perfect bathroom. Not to be dramatic, but I am dying for those faucets...and that tub! Thanks for sharing! What an incredible bathroom!! 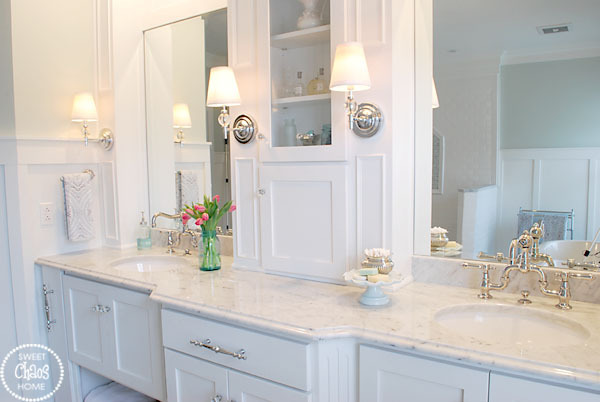 From the marble to the fixtures to the cabinetry, all divine!! 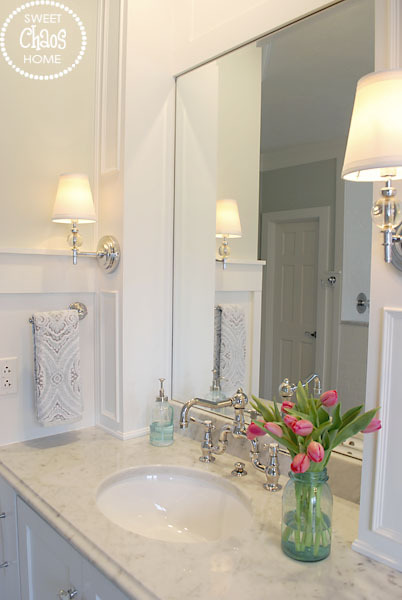 Thanks for sharing your gorgeous bathroom with us, Carolyn. 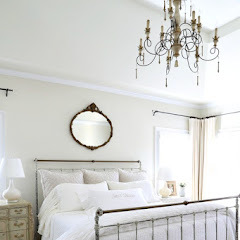 I love Carolyn's home and blog...her bathroom is such a dream!...Yes, as everyone dreams about such a gorgeous bathroom/retreat!...Thanks for sharing Carolyn's bathroom today...I never tire of seeing this beauty!! Have a great weekend Kim and Carolynj! 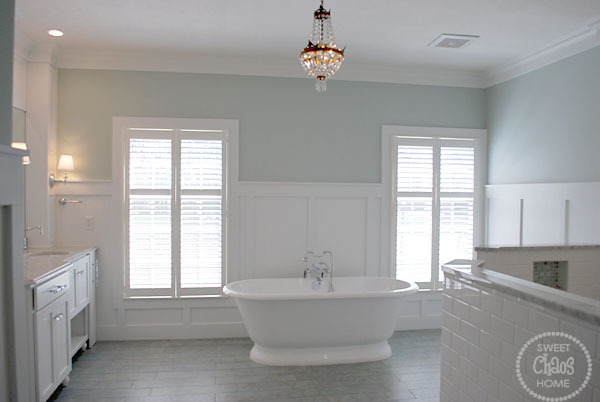 Wow beautiful bathroom!Carolyn did an amazing job! I can see why it is her favorite room! Thank you Kim for sharing ! Impresionante!! como a buen piscis me encanta el agua y aqui podría estar a mis anchas. What a transformation...you did a great job! 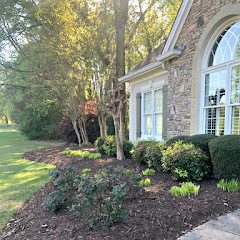 Love this space, thanks for sharing, Kim! Carolyn, I am IN LOVE! You bathroom is just stunning. 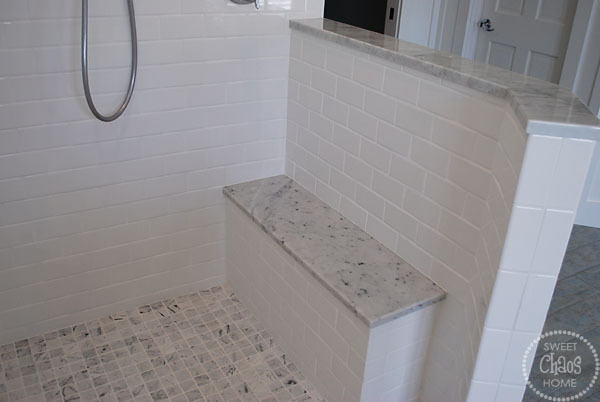 I've been spending a lot of time looking at bathrooms lately as we are planning a master bath reno in early 2014! This is my dream bathroom!!! LOVE it's clean look and lines! 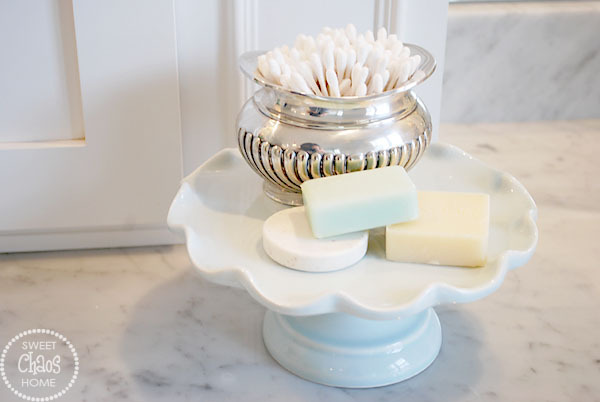 You have turn your bathroom into a haven! Kim, as usual... you have hit a home run with this Carolyn's beautiful bathroom. Thanks for hosting one of my favorite weekly series! I think I've been around my son too much because my first thought when seeing this gorgeous space was DUUUDE! THAT BATHROOM IS HUGE! That bathroom is a dream! I'm headed over to see the rest! I love Carolyn's home! 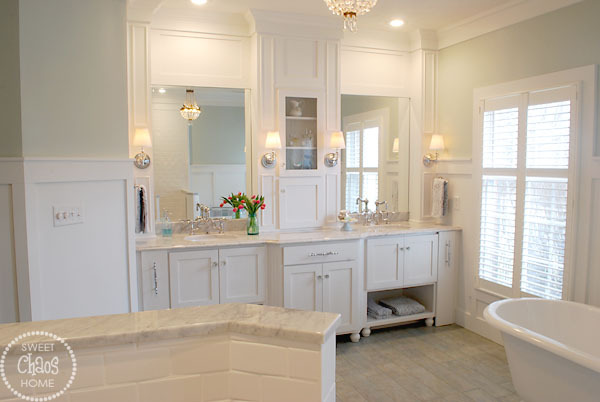 Her master bath is stunning!! Well, if I had a bathroom like that it would be my favorite. Love the big ole soaking tub and the open shower. 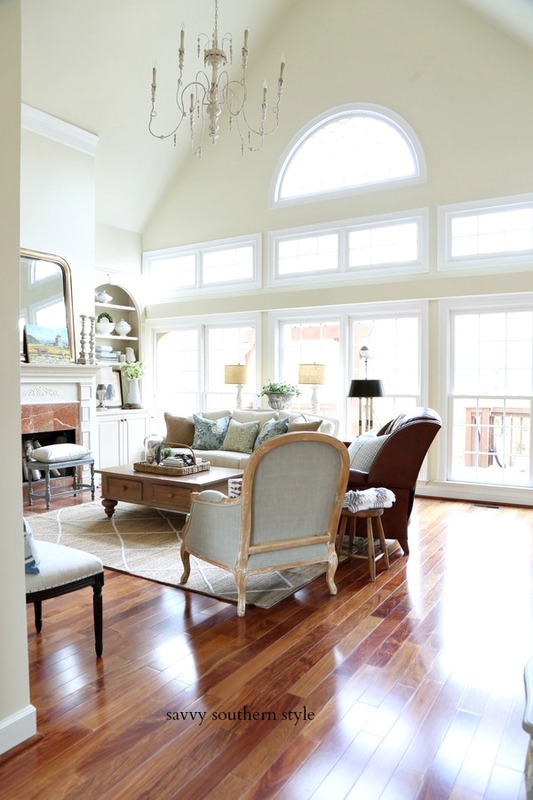 This is a fabulous space! This is BEYOUND Gorgeous! What a treat to take a shower in that bathroom. Oh my, I'm not sure there are adequate words to describe that bathroom. Beautiful bathroom. What is the source of the towel bars next to the sinks. ?I'm looking for something small like that. Towel rings are not my thing. I love your bathroom! Especially the open shower. I would LOVE to have a shower like that, but I'm afraid I would end up splashing water all over the bathroom. Just wondering if that is ever a problem? 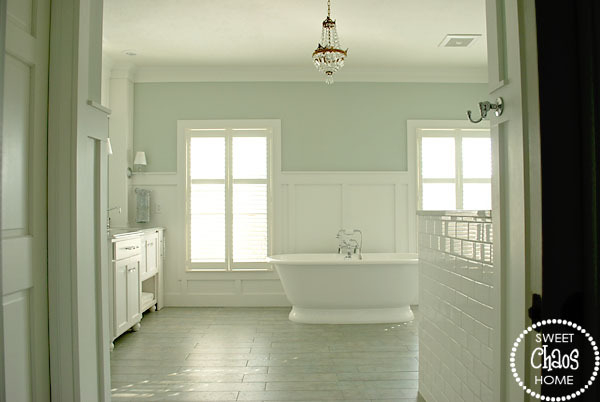 Carolyn's bath is so stunning and a relaxing escape. 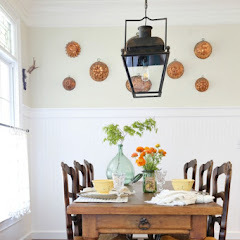 I love the fixtures and that chandlier is gorgeous. Thanks for sharing this with us. Really enjoyable. What a lovely color on the walls! I remember seeing Carolyn's bathroom when she revealed it last year and thinking it was AMAZING! And I still think that, too! Can't believe it's the same space! truly elegant and simply gorgeous! You could put down some nice rugs maybe? I have actually been looking to buy some rugs lately.. anyone know any sites? Wow!!! I can see why this is her favorite room....you can practically live in there! So pretty. I just stumbled upon this series of yours and have had fun looking through some of your guests. Beautiful room! Would you kindly share the paint colour you chose for the walls? I must have missed it.